This is all you've got, 1 document and from which you've produced an entire narrative with a cast of thousands. You guys. Isn't that similar to what the WC did? No, the WC looked at thousands of documents and interviewed hundreds of people, producing 26 volumes of evidence and based their opinion on this mountain of overwhelming evidence. Volume doesn't guarantee a correct outcome and much of their "conclusions" were not supported by the actual evidence in the 26 volumes. Your appeal to authority is meaningless. "Liebeler explained (to Epstein) how the commissions staff lawyers had done virtually all the real detective work." “Liebeler revealed the intense time constraints faced by the staff, a situation made worse by the FBI’s incompetence; he described the bureau’s investigation as “a joke”. He told Epstein about Rankin’s ill- chosen comment at the end of the investigation regarding the need to draw the work to a close, even if there were still unanswered questions; “we are supposed to be closing doors, not opening them”. 1. Alan Fords theory: The curtain rods were "given" to Oswald with "instructions" by a conspirator, and Oswald followed those instructions exactly. Oswald did not get upset enough by Marina to completely just walk out that night of Thursday, but stayed till Friday morning and completed his task. Oswald took the package, was seen by at least BW Frazier, and was seen taking the package thru either the actual back door or the back door of the Annex part of TSBD. Afterwards, conspirators would remove the package before the shooting starts. 2. Walt Cakebread theory: Oswald may have placed the curtain rods OUTSIDE of the TSBD, either somewhere near the actual back door or by the annex building back door, just BEFORE opening the door. 3. Zeon Masons theory: Oswald took the curtain rod package he found in Mrs Paine garage that night and decided just to take it without permission, since he was already upset with not having reconciled his separation with Marina. Oswald went thru the back door of the ANNEX building, still carrying this package, which BRW observed as "going in the back door" of the TSBD. Oswald placed his package in some container inside the Annex building area, in the 30 seconds of time he had before BRW would reach either annex back door or the TSBD back door. The problem for Alans theory , imo, is that its very convoluted and complex and just one little slip up by Oswald and the whole plan falls apart, as far as trying to pre event set Oswald up as having carried in a rifle in a package. Or what other reason would there have been to have Oswald be seen carrying a package? Also, if the reason for the March 15th document is because a package WAS found in TSBD albeit late and unexpected, then either the conspirators FAILED to remove the package or ANOTHER package was placed sometime later to be found, just as a gag? Walts theory, actually might explain Oswald not being able to get his curtain rod package post event, if Oswald did in fact exit TSBD via roll up door on ground floor right beside the west elevator. 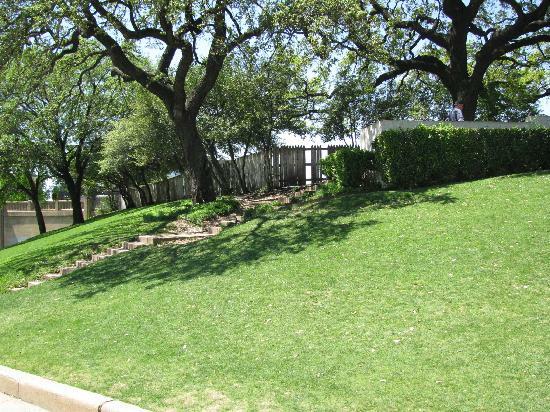 Thus, Oswald exited into the Annex building 1st, saw thru the annex back door window, 1 or 2 plainsclothes officers, as DPD officer Barnett described may have been there watching that exit. Oswald likely would have then gone to the WEST side exit door of the Annex building, thru which he might have escaped, as its its unclear if that west side door was yet being guarded. However, BW Fraziers statement is that he saw Oswald go INTO TSBD with the package, so that would suggest going thru either the actual back door, or the back door of the Annex building. Oswald was actually PAID MONEY, to carry some additional smaller package INSIDE of this larger curtain rod package. That might explain Oswald willing to complete an "instructed" task even though he had been fooled by Mrs Paine to believe Marina wanted to reconcile thus compelling Oswald to return with BW Frazier on Thursday instead of his usual Friday ride. Oswald therefore took the package, and left some of the money he was paid, approx $150 at least, for Marina. He took the package at least as far into TSBD as the Annex building. The conspirators who might not have actually been setting up Oswald as a shooter, as Alan Ford has proposed, took that valuable part of the package and left the actual curtain rods there in that container where Oswald had hidden the package. That might explain finding a curtain rod package some 3 months later, by accidental discovery. If Alan's theory is correct, there are TWO , possibly even THREE sets of conspirators, one set whom really WERE trying to set up Oswald as a shooter, one set whom just wanted Oswald to be a "Mule", to carry in some expensive, substance like cocaine or heroin, and the 3rd set, the post event collusion of LBJ, DPD and FBI to simply make Oswald the scapegoat and avoid any further unpleasant investigation that might expose other corruption. Do you believe both dates on this form are wrong? I asked for actual advertising. Glad to see you amended your post after my comment. And you seem to agree that the "experts", the doctors, were employed to say that cigarettes were safe. "Patrick Quillin, PHD, RD, CNS, former director of nutrition for Cancer Treatment Centers of America in Tulsa, OK, wrote: “It puzzles me why the simple concept ‘sugar feeds cancer’ can be so dramatically overlooked as part of a comprehensive cancer treatment plan” (Nutrition Science News, April 2000). I agree. Sugar is cancer’s favorite food. There are at least five reasons that cancer and sugar are best friends." Some interesting thoughts in your post, Mr Mason, to which we will for sure come back! 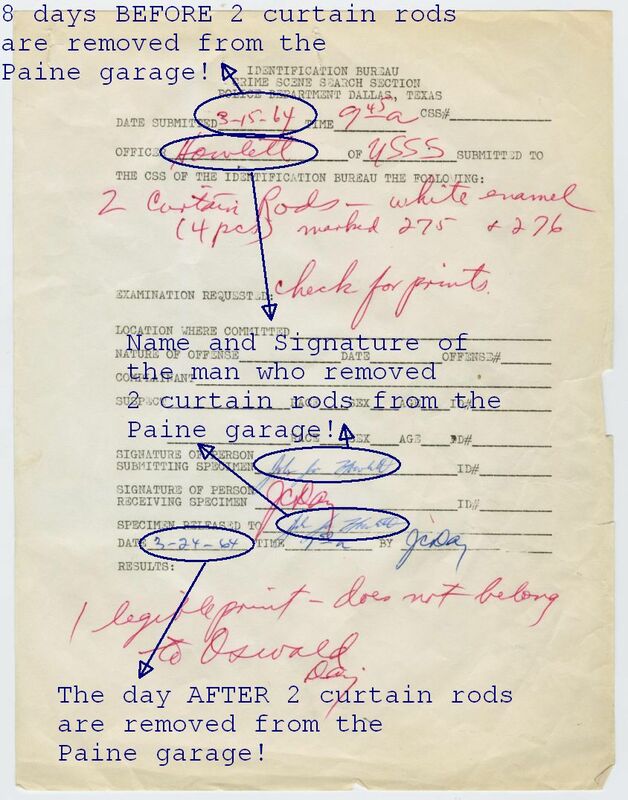 It is clear that no coherent counter-explanation has been given for the clear documentary evidence that 2 curtain rods were submitted to be checked for Mr Oswald's prints 8 days before the WC's visit to the Paine home-----------and not released from the lab until after that visit. Nor has anyone offered a logical alternative location to the Depository as the place where these 2 curtain rods must have been found. I must however note, Mr Mason, that my theory---that Mr Oswald was tricked into bringing 2 curtain rods in a large package into work that morning----is a lot less convoluted than your multiple-sets-of-conspirators scenario. And again----------let's not forget Mr Ralph Yates! In his 2014 (?) interview with Tom Meros, Frazier said that by the time Oswald was 50 feet in front of him, he could no longer see the package that he initially saw Oswald carrying between his armpit and his cupped hand. So, that doesn't rule out the possibility that Oswald ditched the package somewhere between the parking area and the annex door.